It was so sunny... so warm, even hot! Sure, it looked a little dark in the distance, but surely it was a few hours away -- the 50-some thousand people who had gathered for the Statio Orbis to close the International Eucharistic Congress will certainly be able to enjoy sunny skies until the completion of Mass. Even before the opening procession was complete the rain was falling. By the time the first reading was being proclaimed it was a steady downpour. As we began to pray the Our Father, there was a torrential downpour. I could hardly hear the translators over my radio as their microphones were picking up the sound of rain pounding the top of their tent. 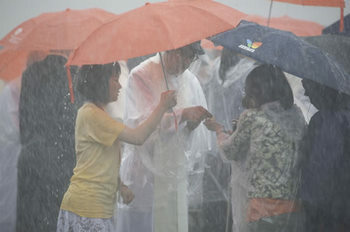 I was drenched in seconds as I ran out of our small -- and quickly becoming muddy -- broadcast tent to receive communion. There's nothing like that squishing-water-logged feeling in one's shoes! "An abundance of rain, and an abundance of God's grace!" proclaimed Cardinal Jozef Tomko at the conclusion of the Mass. His comment broke the tension as confused pilgrims stood around in ponchos which stood no chance against this vicious storm. A smile came to my face, and joy in my heart upon hearing the truth in this statement. There, in my soaking clothes it occurred to me that this is the perfect way to end the week. It was as if we were being washed clean. The grime and dirt that had built up over the years was wiped away! We were beginning anew. It was, as Kris Dmytrenko hinted at in yesterday's blog, a new springtime for the Church in Quebec. What better way to begin a new era than with an outpouring of cleansing waters! And what better way to begin a new era for the Church in Quebec than with this outpouring of God's grace experienced at the Eucharistic Congress!